Welcome to Banglalink 9.5GB Internet Only 129Tk Data Pack Adding 10Tk! Banglalink has launched a fantastic offer where customers can get daily internet bonus by adding only 10 or 5. 129Tk buy internet pack then recharge 10Tk you will get 1GB, you can accept this 1GB within 7 days that means entire 7GB internet only 70Tk. 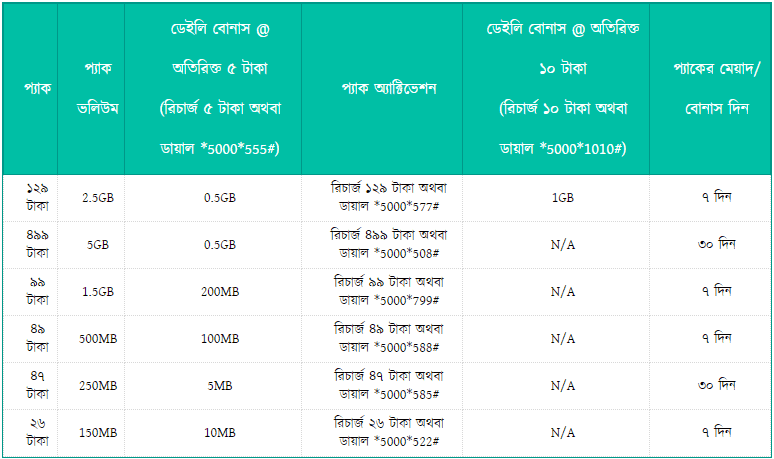 Banglalink 10Tk recharge internet offers 2019, Banglaink 10Tk 1GB offer. Get daily data bonus for 7 days by recharging once only. All Banglalink prepaid and C & C subscribers can avail this add-on offer. After purchasing an internet pack, recharge bonus of 5 Taka / 10 Taka will be available at the customer recharge every day while the validity of the package is available for getting the daily bonus. To activate this offer accurately recharge 10Tk or 5Tk. 10Tk dial code is *5000*1010# or 5Tk dial code is*5000*555#. Dial *124 *550# to know the daily bonus usage. Bonuses will be paid daily until the expiry of the pack. The extra volume of bonus amounts will not be added the next day. Daily Bonus will be closed when the pack expires. Only one add-on pack can be purchased once you purchase any original packaging. Daily Bonus will be paid until the last day of the pack, no consideration that the add-on pack has been launched. This offer is applicable for a limited time.